What if you were a mulitbillionaire but didn't know it? What if for years you had been making monthly deposits in the amount of hundreds of thousands, even millions of dollars (you have), but you have largely remained unaware of it? There is a new way to account for (and more fully employ and enjoy) these deposits and vast holdings. The picture above points the way. You are looking at real currency, in the amount of $100,000. Let me tell you how my wife and I earned, deposited and use this bill. As I tell our story you will see how you too can become a multibillionaire. Move this story to a linked page. The narrative above will be all the narrative I want on this page. 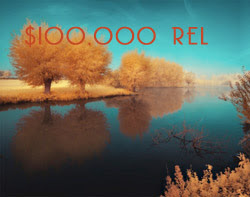 (create and add the SLF 100K dollar picture below....create links to other denominations: I will create 10K, 100K, 1m and 1b bills. Tangible capital is only one of the three capitals. (The other day I let my bishop Tullis know that I had recently inherited a very large amount of money from my Father...he smiled once he had the facts...but this is just the start. My SLF and REL wealth shall be treated separate but equal to my USD wealth...and I shall share such interactions as I did with my bishop in other traditional forums---offers of my wealth in such terms, even if it seems Quixotic. I and others (with the priesthood of God and our inheritance) are equals to the Hunstman's of the world. We too can establish foundations (that help people find places to poop) and endowements (that help keep institutions afloat)...especially, but not exclusively, using REL and SLF dollars (cause we already do). I will also show people (and myself) how to do what our fellow billionaires do with their money. For example, have you ever heard of the Bill and Melinda Gates Foundation? I am currently setting up the Greg and Saebra Muller Foundation. We are planning to seed this foundation with over 2 billion dollars (SLF + REL+USD) in working capital. We will soon join with other organizations, like the Bill and Melinda Gates Foundation, to make huge changes in the world.